Mexico City is a place full of culture, flavours and fun. But like any big city it can be overwhelming at times, which is why we know you’ll want to stay in an amazing hostel full of likeminded travellers. To help you find your perfect accommodation, we’ve created this list of the best hostels in Mexico City*. Most hostels in Mexico City are in the historical centre. This is where you’ll find the Metropolitan Cathedral, Diego Rivera’s murals, Zocalo Square and other main attractions, as well as vibrant markets, authentic restaurants and lively bars. Another popular area for hostels is La Condesa. Its trendy shops, arty atmosphere and amazing nightlife make it the place to be if you’re looking for an alternative location. This hostel is the place to be for solo travellers – you’ll make friends from the moment you arrive. The staff here are extremely welcoming and clued up on local recommendations and activities. They also organize free walking tours to the markets and most interesting neighbourhoods to help you get your bearings. When the night falls head back to your hostel, where a bar full of tequila will be waiting for you at a budget-friendly backpackers’ price. Did we mention the fun themed nights? During your stay at Hostel Mundo Joven Catedral look out for BBQ night, guacamole night, salsa night and of course, tequila night. After a wild evening, what better way to recover than with a free Mexican breakfast? Breakfast is complimentary for all hostel guests and traditional European options are also available. For your comfort and security, there is a reading light and plug socket next to each bed and free personal lockers in every room. What are you waiting for? Get booking! Book now in Hostel Mundo Joven Catedral! Good vibes only at this hostel. It’s a little quieter than the previous hostel, but the friendly staff and cosy common areas make it easy to meet other backpackers. Situated in a fourth-floor Penthouse in the heart of the historical centre, Massiosare is a bright, colourful hostel with street art murals on the walls, perfect for the traveller who wants to chill out and explore Mexico City with new friends. There are two kitchens, one for vegetarians only, and a rooftop with jaw-dropping views. They also offer a delicious free breakfast from 8:30am every day to give you the energy to start exploring the city. Book now in Massiosare El Hostal! The Selina hostels are known for their elegance and beautiful decor, as well as the friendly atmosphere in their common areas. Selina Mexico City Downtown is perfect for couples on any budget as they have three categories of private rooms: standard, deluxe and suite. How fancy are you feeling? From the window of your stunning private room you’ll be able to see the Aztec ruins of Mexico City, and you’ll only have to walk downstairs to try delicious local dishes in the hostel’s restaurant. What a way to immerse yourself in Mexican culture! If you ever decide to leave the hostel (not that you’d need to), you’ll be close to cosmopolitan venues, underground parties and historical sites. Book now in Selina Mexico City Downtown! 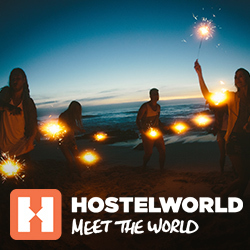 Meet people from all around the globe whilst having a fiesta on the rooftop bar of this hostel! Located in the beautiful and safe neighbourhood of La Roma, you’ll also be close to La Condesa, Mexico City’s hipster district, where you’ll find art galleries, quirky bookstores and some of the best nightlife in town. Book now in Hostel 333! A home away from home with a cheerful atmosphere and outdoor terrace. Suites DF Hostel lovingly cook a different warm breakfast every day, which is not only delicious but totally free! A huge bonus, especially if the night before finished late – a common occurrence in this hostel thanks to its lovely terrace! This hostel is ideally located in the historic centre of Mexico City, close to trendy shops, galleries and plenty of places to drink and dance the night away. Book now in Suites DF Hostel! This beautiful boutique hostel offers the perfect mix of comfort and fun. Relax in a quiet, peaceful room but also join in cheerful weekly events like live music and pub crawls. Casa Pepe’s perks include a free quesadilla buffet for breakfast, a games room with comfy sofas, a huge library and a music area with instruments to play. The rooms are just as fantastic as the rest of the hostel. If you can afford to splurge, why not sleep in a king-size bed with private kitchen facilities? If you’re not feeling spendy, you’ll still get the privacy you need as all the dorm beds have personal curtains and a reading light. PS: Have we mentioned they offer a free tour around the historic centre to guests? Book now in Casa Pepe! Right in the Historic Centre of Mexico City, inside the popular gourmet food market ‘Mercado Gastronómico Independencia’, you’ll find this modern and beautiful hostel. You’re bound to meet other backpackers in the common area, which is connected to the market hall itself! Being close the main spots of Mexico City, this hostel is perfect if you need a central place to rest after a long day’s adventures. The market location makes it a plus for lovers of Mexican food! Book now in The Foodie Hostel! Another hideaway in the historic centre of Mexico City. This pastel coloured hostel has spacious, cosy rooms, a beautiful outdoor patio and two common areas to relax and meet other backpackers. At Casa San Ildefonso you can enjoy a totally chilled atmosphere right in the middle of Mexico City’s most iconic landmarks, such as the San Ildefonso Museum, Zocalo Square and the Cathedral. Book now in Casa San Ildefonso! Gael Condesa is in the trendy neighbourhood of La Condesa, an alternative area of Mexico City with a serious hipster feel. Guests at Gael Condesa can enjoy weekly BBQs and yoga lessons, as well as a delicious free breakfast every day. This hostel offers all the comforts you need; curtains on every bed for privacy, personal lockers and a kitchen where you can try and cook one of these easy meals! There’s an outdoor terrace and a coffee shop that gives discount to anyone staying in the hostel. Book now in Gael Condesa! The concept of this futuristic hostel will blow your mind. Each bed is a spaceship capsule which is lockable with a key-card and has its own flat screen TV. The hostel is located in the International Airport of Mexico City, so it’s ideal if you have an early flight or a long layover. It’s also just a few metro stops away from the city centre, so it doesn’t take long to get out and start exploring. If you’re looking for privacy and convenience, this is your hostel!